We’re so excited to invite you to join us at Flywheel’s “Blue Carpet Event,” this Friday night, February 28, at Flywheel Highland Park. 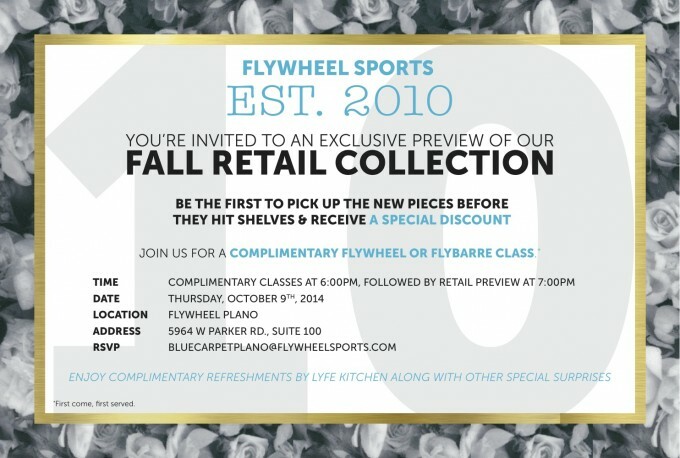 Flywheel is rolling out their new retail line for spring 2014 & we can’t wait to see everything! Whether you’re new to Flywheel, or a Flywheel veteran, you can take Mark’s 4:30 class at no charge. If you haven’t tried Flywheel, we highly recommend this high-energy, party kind of workout. It’s so hard – in a good way! Join us afterward, or arrive at 5:30, to view the collection and pick your favorites before they hit the shelves next month. There will be a DJ and Roots cold-pressed juices to enjoy as well. What a great way to kickoff the weekend! RSVP by tomorrow, February 25 at bluecarpethighlandpark@flywheelsports.com. Can’t wait to see you there!